해당 개요 동영상으로 Mac Pro Late 2013 수리 방법을 배워 보십시오. After making its debut during the WWDC 2013 Keynote, the reimagined, reformulated Mac Pro finally arrived at iFixit's doorstep. Join us as we turn the (very) Late 2013 Mac Pro inside-out. Follow us on Twitter, Instagram, and Facebook for all the latest news and updates! 해당 분해도는 수리 안내서가 아닙니다. Mac Pro Late 2013 수리는 저희 서비스 설명서를 사용하십시오. The new Mac Pro has been released, and we've managed to get our hands on the entry-level model, "inexpensively" priced at $2,999. Here's a strangely un-Apple-like design choice: simply sliding the lock switch allows us to remove the outer casing of the Mac Pro. No stubborn pentalobe screws here! What other improved repairability features will we find in this soda can desktop computer? Only time and spudgers will tell. We're sincerely hoping it's more cowbell. 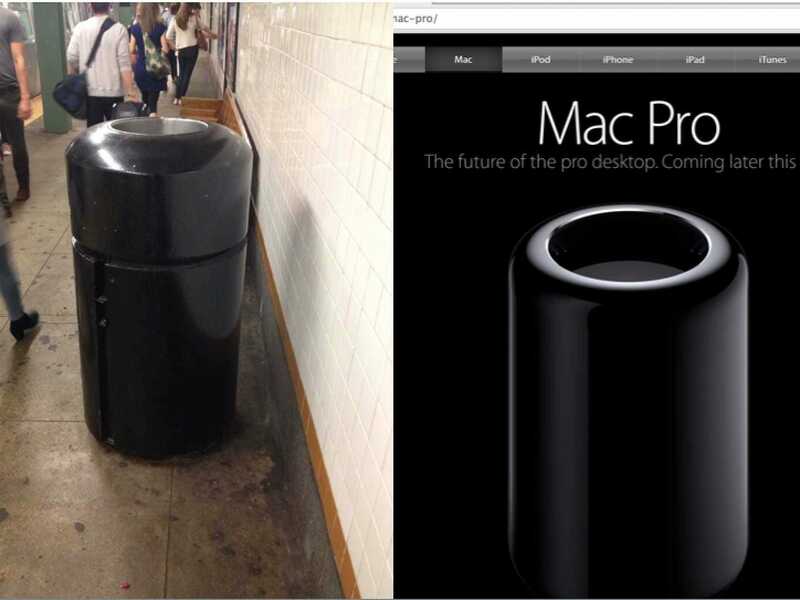 With the cylindrical cover removed, we get our first peek inside the Mac Pro. The dual graphics cards dominate the initial view. Their symmetry is broken only by the SSD cage nestled up alongside the second graphics card. Giving the Mac Pro a little spin, we find neatly positioned vertical RAM slots at either side of the I/O panel. Good news, everyone! The RAM in the Mac Pro Late 2013 is easily accessible and replaceable. The 4 GB DDR3L SDRAM (three for a total of 12 GB) modules are labeled as Elpida EBJ04EG8BFWB-JS-F. According to Apple, the RAM in the Mac Pro is configurable to 16 GB (four 4 GB), 32 GB (four 8 GB) or 64 GB (four 16 GB). With a twist of a T8 screwdriver, the SSD assembly is easily removed from the device. This combination of hardware makes the Mac Pro's SSD suspiciously similar to those we've seen in the latest refresh of MacBook Pro Retina and MacBook Air. ...and it's rated for 100-240 volts AC, making it a willing international travel partner. There can only be one fan. The Mac Pro is vented by a single fan, which pulls air from under the case, through the core, and out the top of the case. Teardown update: You asked, we answered. We popped the plastic roof off the fan module and found a whole new stash of precision engineering. Snug in a nest of antennas, the AirPort card fits onto a small adapter board that also connects to the fan below. Those three large screws secure the fan, with vibration-dampening rubber bumpers, like we've seen in iMacs. The gold antenna array pops out, and sees all. With the fan released, it looks to be powered by a Nidec brushless DC motor, model number AG720K01. The motor controller IC is an Allegro Microsystems A5940LPT Three Phase Sensorless Sinusoidal Fan Driver. We noticed a few cavities around the edges of the impeller filled with some sort of epoxy (on both sides). We suspect it's for fine-tuned balancing, to keep the fan running smooth and quiet. A view from above: The Mac Pro utilizes a giant triangular heat sink ("Thermal Core"), shared by the dual graphics cards and CPU. Looks like the Mac Pro has taken some design pointers from the recent AirPort Extreme and Time Capsule bodies: a thin, vertical design with individual boards on separate sides. We use our spudger to pry the graphics card data connectors from their sockets. This FCI Meg-Array connector is the same type used for the G4 & G5 PowerPC processor daughtercards, and looks to be a fully custom way of hooking up PCI-E, with many pins in a pressed-in connector. With the Mac Pro's structure dominated by the central heat sink, we'd best start by peeling parts off. A clamp and four screws hold each of the dual AMD FirePro D300 graphics cards in place. Amidst the usual processing power and cost comparison with a similar home-built desktop PC, these graphics cards may be the key to Apple finally undercutting homebrew systems on a pure power basis. While this stacks up fairly well for current Apple GPU offerings, the proprietary nature, and lack of an elegant external GPU option, may age this device before its time. But wait, there's more. Just one more: a second, slightly different FirePro card. This GPU—same make and model—hails from Taiwan, unlike its Chinese-made twin. The other important difference to note is that this card (and only this card) hosts the slot for the SSD. This seems to us like a potential opportunity for expansion—perhaps higher storage configurations make use of two of this variety, for doubling up on SSDs? A novel disc-shaped daughterboard ties everything together at the base of the machine. Having spudgered away the ribbon cables, we flip it over for a closer look. Dominated by inscrutable proprietary connectors, we can only hope the ICs on this interconnect board will tell us more about its purpose. The logic board, dual graphics cards, and I/O port board all connect to this single board. The back of the daughterboard features the same 980 YFC LM4FS1BH System Management Controller found in the Mid 2013 MacBook Air refreshes. Pulling up a black cover grille, we discover where Apple hid the power supply: it's sandwiched between the I/O panel and the logic board. ...and with that, the I/O board and power supply peel away as a unit. The logic board is the next logical step. The CPU is the last to go, left clinging to the side of the heat sink via a thin smear of thermal paste. Quad-Core Intel Xeon E5-1620 v2 with 10 MB L3 cache, clocked at 3.7 GHz, Turbo Boost up to 3.9 GHz. While it took a bit of a trek, a CPU upgrade appears entirely possible—and well worth it, with an alleged cost savings of $1050 for an upgrade to 12 cores. Hard to port! Port board, that is. Also along for the ride is a standard BR2032 CMOS battery. With a rated output of 12.1 Volts and 37.2 Amps, we're looking at a 450 Watt power supply. The power supply has no dedicated cooling, and relies on the main system fan to keep cool—allowing the Mac Pro to idle at a whisper-quiet 12 dBA. For comparison, we found a 450 Watt PSU in our recent Steam Machine teardown. The Steam Machine's SilverStone power supply featured a "silent running 80 mm fan with 18 dBA minimum." And a quick look at what's left on the behemoth of a heat sink: Heavy gauge, flat power cables run from the PSU to the logic board and graphics cards, and remain intertwined in the heat sink. We speculate they may be Texas Instruments MSP430 16-bit Microcontrollers. For being so compact, the design is surprisingly modular and easy to disassemble. Non-proprietary Torx screws are used throughout, and several components can be replaced independently. The easily-opened case is designed to make RAM upgrades a snap. The fan is easy to access and replace. While it will require a bit of digging, the CPU is user-replaceable—meaning intrepid fixers should be able to save considerably by upgrading from the base-level processor configuration. There is no room, or available port, for adding your own internal storage. Apple has addressed this with heaps of Thunderbolt, but we'd personally rather use the more widely compatible SATA if we could. With some proprietary new connectors and tight cable routing, working on this $3,000 device without a repair manual could be risky. The microcontrollers on the inside of the port panel must be for the illumination that lights up the ports. Somewhere there's a sensor that knows when you're turning the thing around too. Do they use a MEMS sensor for that? The connectors shown in Step 8 appear to be identical to the CPU sockets used in the PowerPC G3 & G4 processors. Good connectors, solid, never had an issue with them. No need to reinvent the wheel. It is under the Roof, the black cover in the middle of the fan. The card handles Airport and Bluetooth. There are four antennas connected to the card.